Despite innumerous progress in our knowledge about cancer in the recent decades, the incidence and mortality of cancer are increasing. Therefore, there have been several studies to find new anticancer compounds  . It has been shown that plants provide important resources of active anticancer ingredients persuading scientists to focus on their anti-tumor agents (2-4). Colchicine, vincristine, vinblastine, and paclitaxel are some important anticancer drugs with plant origin , . In recent years a significant percentage of anticancer drugs are in clinical trials that are derived from natural resources , . Pinaceae is the largest family in the order Pinales (previously known as Coniferales), including about 11 genera and more than 220 species. The Pinsus genus is the largest in this family  . They are described as coniferous, resinous, evergreen and mostly monoecious trees or rarely shrubs that are grown or cultivated in the most regions of Northern Hemisphere. They have been used in industries and medicine during long period of the human civilization in the entire world  . Among this family, Pinus eldarica is an evergreen tree that naturally occurs in the Transcaucasian region between Europe and Asia and also grows in Iran as  one of the most abundant pines in Iran. Bark of P. eldarica contains polyphenolic compounds such as taxifolin and catechin that also found in P. pinaster, that is provided as picnogenol® with broad pharmacological activities , . In addition, its bark essential oil contains compounds such as α-pinene and In addition, its bark essential oil contains compounds such as α-pinene and caryophyllene oxide  . Traditionally P. eldarica have been used for treatment of bronchial asthma  , skin wounds, skin irritations, allergic rashes, and dermatitis  . Also, it has been shown that pine needles contain considerable amount of terpenoids, polyphenols and tannins  . In some studies antineoplastic and immunomodulatory effects of these compounds have been reported ,, . As, in several studies, it has been shown that P. eldarica contains important compounds similar to those of other species of pine genus with cytotoxic effects, we aimed to evaluate the cytotoxic activity of essential oil and different extracts of P. eldarica on HeLa and MCF-7 cancer cell lines. Compounds used were: Methanol, 3-(4,5-dimethylthiazol-2-yl)-2,5-diphenyl tetrazolium bromide (MTT), sodium chloride, potassium chloride, hydrochloric acid, sodium hydroxide, sodium bicarbonate, sodium phosphate (Merck, Germany), sulfuric acid , penicillin/streptomycin (Sigma, USA), RPMI1640, fetal calf serum (FCS), sodium pyruvate, trypsin, L-glutamine (Gibco, Scotland), dimethyl sulfoxide (DMSO) (Fluka, Italy) and doxorubicin (Farmitalia, Italy). The bark and leaf samples of P. eldarica were collected from the plants grown in Isfahan district on November 2015 and identified by the Department of Pharmacognosy in the School of Pharmacy and Pharmaceutical Sciences of Isfahan University of Medical Sciences at Isfahan, Iran. The bark and leaf of the plant were dried and was ground to yield a fine powder. Using the maceration method, for hydroalcoholic extract, 20 g of either bark or leaf powder was soaked in sufficient volume of methanol/water (70/30) and shaken for 1 h. Then the mixture was macerated for 1 day and then filtered through a Buchner funnel three times separately. For phenolic extract, extraction was carried out in two steps with methanol/water (9:1) and (1:1). Finally the extracts were concentrated using a rotary evaporator and dried by a freeze dryer and kept at 4 °C until use (18). Different concentrations of the extracts (10, 20, 50, 75, 100, and 200 μg/mL) and essential oil (0.2, 0.1, 0.05, 0.025, and 0.01 μL/mL) were prepared. DMSO was used as the solvent for preparation of the stock solution (maximum 10%). The essential oil of plant fresh leaves were extracted by steam distillation using a Clevenger-type apparatus during 4 h and stored at 4 °C until analysis. Analysis of the oil was carried out using a Hewlett Packard 6890 gas chromatograph/mass spectrometer (GC/Mass) instrument with the following conditions: volume injected: 0.1 mL of the sample, helium carrier gas flow rate: 2 mL/min, injection site temperature: 250 °C, column: HP-5MS capillary column (30 m × 0.25 mm with film thickness of 0.25 μm), column temperature: 60-275 °C at 4 °C/min, mass spectra: ionized potential 70 eV, source temperature: 250 °C, resolution: 1000, ionization current: 1000 µA, mass range: 30-300  . Identification of the components was based on the computer matching against library spectra (Library Database Wiley 275 L), their retention indices with reference to an n-alkane series in a temperature programmed run, interpreting their fragmentation pattern and comparison of the mass spectra with those relevant reference samples and the literature , . The total phenolic content of the bark and leaf extract of P. eldarica was determined by Folin-Ciocalteu reagent  . For this function, the calibration curve of gallic acid was drawn to calculate the total phenolic compounds. Gallic acid was used as a reference standard. To prepare the stock solution of gallic acid, 0.5 g of dry gallic acid was dissolved in 10% hydroalcoholic solutions and concentrations of 0, 50, 100, 150, 250, and 500 mg/L were made. The absorbance of standard solutions and samples were determined spectrophotometrically at 765 nm. The total phenolic compound contents were expressed as mg gallic acid equivalents per gram of the extracts. The test was repeated three times. HeLa (human epithelial cervix carcinoma) and MCF-7 (human breast carcinoma) cell lines were obtained from Pasture Institute of Iran, Tehran, Iran. Cells were grown in RPMI-1640 supplemented with 10% FBS, 100 U/mL penicillin, 100 mg/mL streptomycin , 1 mM sodium pyruvate, 1 g NaHCO 3 and 2 mM L-glutamine. Finally, the media was sterilized using 0.22 microbiological filters and kept at 4 °C before use. Cells were grown in RPMI 1640 at 37 °C in a 5% CO 2 incubator. Cytotoxicity of the essential oil and different extracts of P. eldarica against HeLa and MCF-7 cell lines was determined by a rapid colorimetric assay, using MTT  . In this test soluble MTT is metabolized by mitochondrial enzyme activity of viable cells into an insoluble dye formazan product. Subsequently formazan was dissolved in DMSO and measured spectrophotometrically at 540 nm. Briefly, 180 μL of cell suspension (5 × 10  cells/mL of medium) was seeded in 96-well microplates and incubated for 24 h (37 °C, 5% CO 2 air humidified). Then 20 μL of the prepared concentrations of essential oil and extracts, were added to each well. The plates were incubated for another 48 h in the same condition. For the positive and negative controls doxorubicin and DMSO 1% were used, respectively. To assess cell survival, 20 µL of MTT solution (5 mg/mL in PBS) was added to each well and the plates were incubated at 37 °C for 3 h. Then the old media containing MTT was removed and gently 150 µL DMSO was added to each well and pipetted to dissolve the formed formazan crystals. Absorbance was measured by an ELISA plate reader (Startfix-2100, Awareness, USA) at 540 nm. Each extract concentration was assayed in 4 wells and repeated 3 times. Standard curves (absorbance against the number of cells) for each cell line were plotted. Cell viability was calculated based on the standard curves. Cell survival in the negative control was assumed 100%. SIGMASTAT™ (Jandel Software, CA, USA) was used to perform statistical tests. Analysis of Variance (ANOVA) followed by the Student-Newman-Keuls test was used to see the differences among the groups. Significance was assumed at 5% level. The yields of the leaf and bark hydro alcoholic and bark phenolic extract was found to be 22.05%, 19.55%, and 19.05%, respectively. The essential oil content of the fresh leaves was 0.1% v/w. 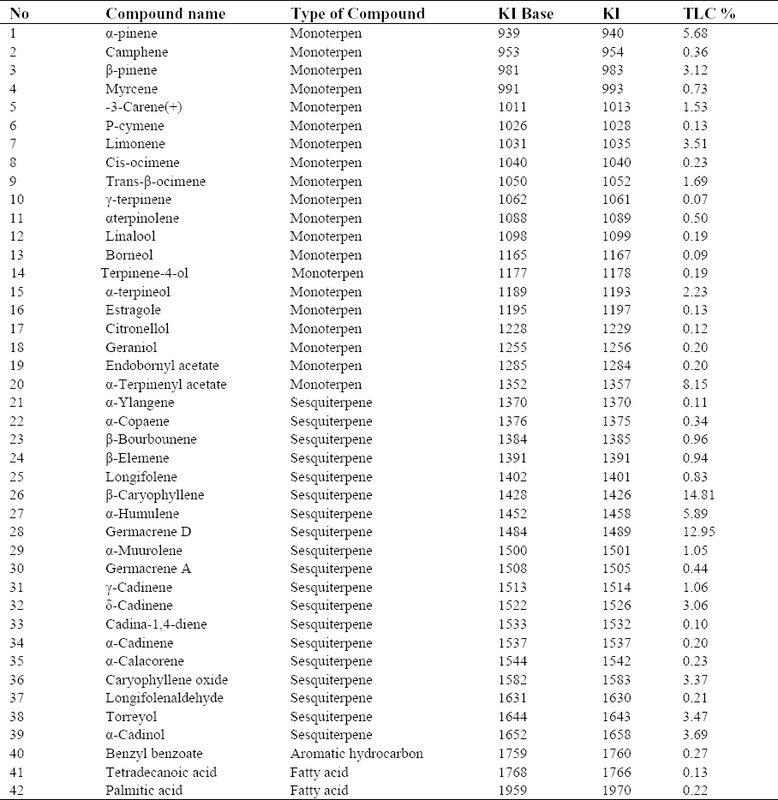 Phenolic content of the plant extracts which was determined by Folin Ciocalteu reagent is shown in [Table 1]. The results are reported as mg gallic acid equivalents per gram of the extracts. Forty two constituents accounting for 83.34% of the leaf oil were identified [Table 2]. The essential oil composition was 29.01% monoterpenoid, 53.71% sesquiterpenoid, 0.35% fatty acid, and 0.27% aromatic hydrocarbon. Major components in the leaf essential oil were ß-Caryophyllene (14.81%), germacrene D (12.95%), α-terpinenyl acetate (8.15%), -αhumulene (5.89%), and α-pinene (5.68%). For HeLa and MCF-7 cells a good relationship between absorbance and the number of cells was observed (r  = 0.948 and 0.950, respectively). Doxorubicin (40 μg/mL), as a positive control, significantly inhibited the growth of tested cell lines (less than 25% in HeLa and 40% in MCF-7 cell lines). Extracts which caused at least 50% growth inhibition were considered as cytotoxic. 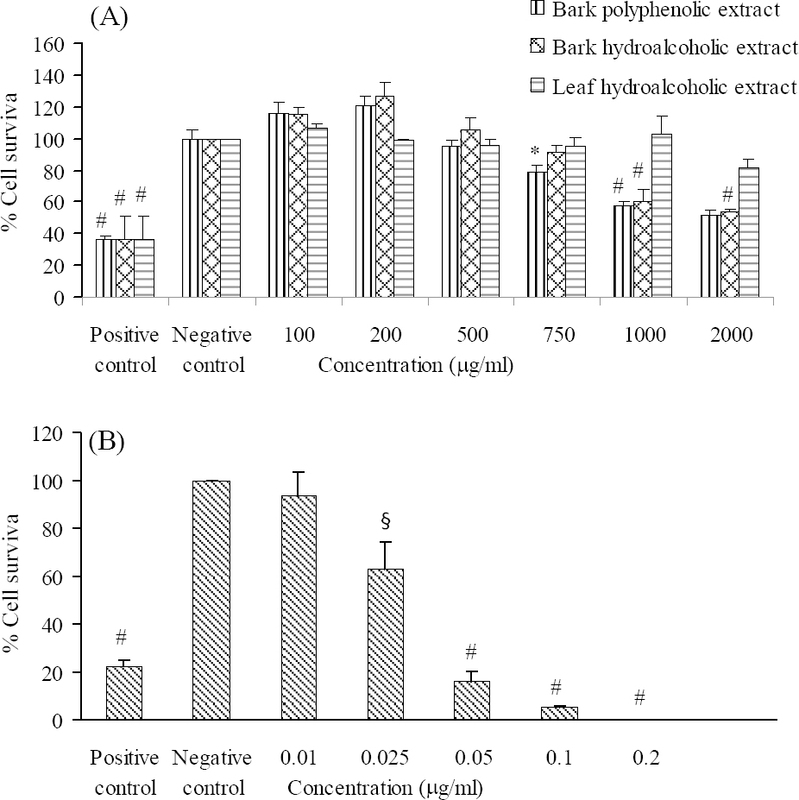 The cytotoxic effect of different concentrations of the essential oil and the bark and leaf extracts of P. eldarica on HeLa and MCF-7 cells are shown in [Figure 1] and [Figure 2]. Our findings showed that leaf essential oil and bark polyphenolic extracts of P. eldarica significantly (P < 0.001 and P < 0.01, respectively) and concentration dependently decreased viability of HeLa and MCF-7 cells. Hydroalcoholic extract of P. eldarica leaf showed no significant inhibitory effects against both cell lines compared to bark extracts. The essential oil showed more cytotoxicity than the extracts on HeLa and MCF-7 cells. Bark polyphenolic extract was more toxic on both cell lines compared to either bark or leaf hydroalcoholic extracts. Bark hydroalcoholic extracts were more effective than the leaf hydroalcoholic extract in both cell lines. Figure 1. The effects of the (A) extracts and (B) essential oil of P. eldarica on HeLa cells. Viability of the cells was assessed by MTT assay. Percent cell survival in the control group was assumed 100. * P < 0.05, § P < 0.01, # P < 0.001, compared with negative control, n = 3. Nowadays, scientists are attempting to identify and isolate new anticancer agents with plant resources. Cytotoxic compounds are among the most important anticancer drugs , . It has been shown that some plant active ingredients such as alkaloids, flavonoids, terpenoids, and phenolic compounds possess cytotoxic activity , . Several studies have shown the presence of cytotoxic agents in plants belonging to Pinaceae family ,, . In the current study by using MTT assay, we evaluated the cytotoxic effect of essential oil and bark and leaf extracts of P. eldarica against HeLa and MCF-7 cancer cell lines. Doxorubicin, a known cytotoxic agent  , as a positive control, significantly decreased viability of HeLa and MCF-7 cells, indicating the accuracy of the method employed in this experiment (P < 0.05). Cytotoxic effects of some Pinus species have already been evaluated on different cell lines. Huang et al. showed that pycnogenol inhibited the growth of HL-60, U937, and K562 cells with IC50 of 150, 40, and 100 μg/mL, respectively  . Also, in agreement with the results of the present study, Kwak et al. showed that ethanol extract of P. densiflora needles inhibited the growth of KATO and MCF-7 cells with IC50 of 209 and 241 µg/mL, respectively  . Our findings indicated that hydroalcoholic and polyphenolic extracts of bark and leaves of P. eldarica significantly and concentration-dependently decreased viability of HeLa and MCF-7 cells. As bark polyphenolic extract showed more efficacy than that of its hydroalcoholic extract in both cell lines, it can be concluded that at least, in part, polyphenols are involved in cytotoxic activity of this plant. Studies have shown that phenolic compounds possess cytotoxic effect mainly through induction of apoptosis ,, . P. sylvestris and P. pinea contain considerable amount of polyphenols such as taxifolin and procyanidin with antiproliferative effect on LNCaP, MCF-7, and DU 145 cells , . Also, the bark extracts of P. eldarica were more potent than that of the leaves of this plant. The greater amount of polyphenols present in the extracts of bark of P. eldarica can explain this difference. The essential oil of P. eldarica showed considerable cytotoxicity on the HeLa and MCF-7 cells with IC50 of 0.038 and 0.032 µg/mL, respectively. It has been shown that terpens play an important role in cytotoxicity of essential oils  . 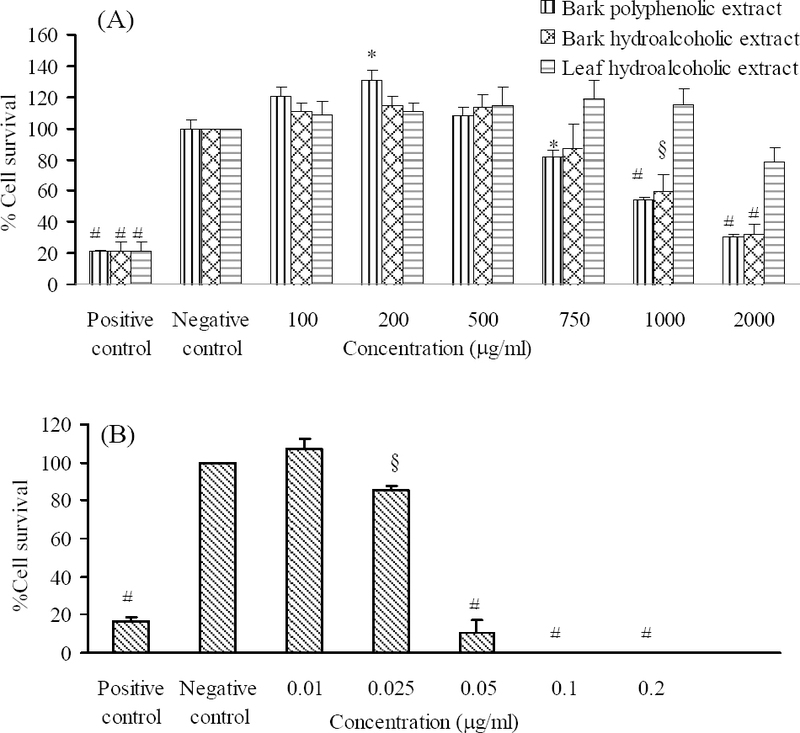 Cytotoxic activity of needle and bark oils of P. roxburghii against MCF-7 cells at 100 μg/mL concentrations indicated 70.9 ± 1.4% and 100% cell toxicity  . Our findings showed that leaf essential oil of P. eldarica contained ß-caryophyllene (14.81%), germacrene D (12.95%), α-terpinenyl acetate (8.15%), α-pinene (5.68%), and α-humulene (5.89%) that could be responsible for its cytotoxic activity. Several studies have shown that ß-caryophyllene oxide, germacrene D, and α-humulene possess significant cytotoxic activity against various tumor cell lines ,, . According to our data, essential oil and extracts of P. eldarica had more cytotoxic effect on HeLa than MCF-7 cell. These differences in susceptibility of different cells have been shown by other studies ,,. It can be calculated from the findings of this study that essential oil of P. eldarica could be considered as a potential cytotoxic candidate for further studies to achieve antitumor agents. Ferlay J, Soerjomataram I, Dikshit R, Eser S, Mathers C, Rebelo M, et al. Cancer incidence and mortality worldwide: sources, methods and major patterns in GLOBOCAN 2012. Int J Cancer. 2015;136(5): 359-386. Hoffman EJ. Cancer and the search for selective biochemical inhibitors. Washington DC: CRC Press 1999:2-18, 57-96 . Kaur R, Kapoor K, Kaur H. Plants as a source of anticancer agents. J Nat Prod Plant Resour. 2011;1(1):119-124. JG, Quinn ML, Fabricant DS, Farnsworth NR. Plants used against cancer - an extension of the work of Jonathan Hartwell. J Ethnopharmacol. 2000;73(3):347-377. Cragg GM, Newman DJ. Antineoplastic agents from natural sources: achievements and future directions. Expet Opin Investig Drugs. 2000;9(12):2783-2797. Mahboobi S, Sellmer A, Beckers T. Development of tubulin inhibitors as antimitotic agents for cancer therapy. Studies Nat Prod Chem. 2006;33:719-750 . Liston A, Gernandt DS, Vining TF, Campbell CS, Piñero D. Molecular phylogeny of Pinaceae and Pinus. RR Mill, ed. Proceedings of the Fourth International Conifer Conference. Acta Hortic 615, Brugge, 2003, pp. 107-114. Evanse WC.Trease and Evans' Pharmacognosy, 16 th ed. London: Elsevier; 2009, pp. 22. Nagao T, Komine Y, Soga S, Meguro S, Hase T, Tanaka Y, et al. Ingestion of a tea rich in catechins leads to a reduction in body fat and malondialdehyde-modified LDL in men. Am J Clin Nutr. 2005;81(1):122-129. Iravani S, Zolfaghari B. Phytochemical analysis of Pinus eldarica bark. Res Pharm Sci. 2014;9(4):243-250. Iravani S, Zolfaghari B. Pharmaceutical and nutraceutical effects of Pinus pinaster bark extract. Res Pharm Sci. 2011;6(1):1-11. Mamedov N, Craker LE. Medicinal plants used for the treatment of bronchial asthma in Russia and Central Asia. J Herbs Spices Med Plants. 2001;8(2-3):91-117. Mamedov N, Gardner Z, Craker LE. Medicinal plants used in Russia and Central Asia for the treatment of selected skin conditions. J Herbs Spices Med Plants. 2005;11(1-2):191-222. Lee E. Effect of powdered pine needle (Pinus densiflora Sieb et Zucc.) on serum and liver lipid composition and antioxidative capacity in rats fed high oxidative fat. J Korean Soc Food Sci Nutr.2003;32(6):926-930. Rohdewald P. A review of the French maritime pine bark extract (Pycnogenol), A herbal medication with a diverse clinical pharmacology. Int J Clin Pharmacol Ther. 2002;40(4):158-168. Li K, Li Q, Li J, Gao D, Zhang T, Han Z, et al. Effect of procyanidins from Pinuskoraiensis0 bark on growth inhibition and expression of PCNA and TNF-á in mice with U14 cervical cancer. Therapy. 2007;4(5):685-690. Potta SP, Doss MX, Hescheler J, Sachinidis A. Epigallocatechin-3-gallate (EGCG): A structural target for the development of potential therapeutic drugs against anti-proliferative diseases. Drug Design Rev Online. 2005;2(1):85-91. Minaiyan M, Ghannadi A, Etemad M, Mahzouni P. A study of the effects of Cydoniaoblonga miller (quince) on TNBS-induced colitis in rats. Res Pharm Sci. 2012;7(2):103-110. Matsuo AL, Figueiredo CR, Arruda DC, Pereira FV, Scutti JA, Massaoka MH, et al. á-Pinene isolated from Schinustereb inthifolius Raddi (Anacardiaceae) induces apoptosis and confers antimetastatic protection in a melanoma model. Biochem Biophys Res Commun. 2011;411(2):449-54. Adams RP. Identification of essential oil components by gas chromatography / mass spectroscopy . J Am Soc Mass Spectrometry. 1997;8(6): 671-672. Sandra P, Bicchi C. Capillary gas chromatography in essential oil analysis. Huethig, Heidelberg 1987;259-274, 287-328. Twentyman PR, Luscombe M. A study of some variables in a tetrazolium dye (MTT) based assay for cell growth and chemosensitivity. Br J Cancer. 1987;56(3):279-285. Sadeghi-aliabadi H, Emami A, Saidi M, Sadeghi B, Jafarian A. Evaluation of in vitro cytotoxic effects of Juniperus foetidissima and Juniperus sabina extracts against a panel of cancer cells. Iranian J Pharm Res. 2009;8(4):281-286. Nobili S, Lippi D, Witort E, Donnini M, Bausi L, Mini E, et al. Natural compounds for cancer treatment and prevention. Pharmacol Res. 2009;59(6):365-378. Lee KH. Novel antitumor agents from higher plants. Med Res Rev. 1999;19(6):569-596. Firdaus M, Prihanto AA, Nurdiani R. Antioxidant and cytotoxic activity of Acanthus ilicifolius flower. Asian Pac J Trop Biomed. 2013;3(1):17-21. Cui YY, Xie H, Qi KB, He YM, Wang JF. Effects of Pinus massoniana bark extract on cell proliferation and apoptosis of human hepatoma BEL-7402 cells. World J Gastroenterol . 2005;11(34):5277-5282. FallahHuseini H, Anvari MS, Tajallizadehkhoob Y, Rabbani S, Sharifi F, Arzaghi SM, et al. Anti-hyperlipidemic and anti-atherosclerotic effects of Pinus eldarica Medw. nut in hypercholesterolemic rabbits. Daru J Pharm Sci. 2015;23:32. Fallahhuseini H, Mehrzadi S, Ghaznavi H, Tajallizadehkhoob Y, Fakhrzadeh H. Effects of Pinuseldarica Medw. Nut extract on blood glucose and cholesterol levels in hypercholesterolemic alloxan-induced diabetic rats. J Med Plants. 2013;12(45):68-74. Jafarian A, Emami SA, Saeidi M, Sadeghi H. Cytotoxicologic studies of the extract of Iranian Juniperus sabina and Platycladus orientalis on cancer cells. J Res Med Sci. 2004;5:205-209. Huang WW, Yang JS, Lin CF, Ho WJ, Lee MR. Pycnogenol induces differentiation and apoptosis in human promyeloid leukemia HL-60 cells. Leuk Res. 2005;29(6):685-692. Kwak CS, Moon SC, Lee MS. Antioxidant, antimutagenic, and antitumor effect of pine neddles (Pinus densiflora). Nutr Cancer. 2006;56(2):162-171. Huang WY, Cai YZ, Zhang Y. Natural phenolic compounds from medicinal herbs and dietary plants: potential use for cancer prevention. Nutr Cancer. 2010;62(1):1-20. Machana S, Weerapreeyakul N, Barusrux S, Nonpunya A, Sripanidkulchai B, Thitimetharoch T. Cytotoxic and apoptotic effects of six herbal plants against the human hepatocarcinoma (HepG2) cell line. Chin Med. 2011;6(1):39. Taner G, Aydýn S, Aytac Z, Basaran AA, Basaran N. Assessment of the cytotoxic, genotoxic, and antigenotoxic potential of Pycnogenol in in vitro mammalian cells. Food Chem Toxicol. 2013;61:203-208. Amalinei RL, Trifan A, Cioanca O, Miron SD, Mihai CT, Rotinberg P, et al. Polyphenol-rich extract from Pinus sylvestris L. bark--chemical and antitumor studies. Rev Med Chir Soc Med Nat lasi. 2014;118(2):551-557. Yesil‐Celiktas O, Ganzera M, Akgun I,Sevimli C, Korkmaza KS, Bedir E. Determination of polyphenolic constituents and biological activities of bark extracts from different Pinus species. J Sci Food Agric. 2009;89:1339-1345. Conforti F, Menichini F, Formisano C, Rigano D, Senatore F, Apostolides Arnold NA, et al. Comparative chemical composition, free radical-scavenging and cytotoxic properties of essential oils of six Stachys species from different regions of the Mediterranean Area. Food Chem. 2009;116(4):898-905. Satyal P, Paudel P, Raut J, Deo A, Dosoky NS, Setzer WN. Volatile constituents of Pinus roxburghii from Nepal. Pharmacognosy Res. 2013;5(1):43-48. Jun NJ, Mosaddik A, Moon JY, Jang KC, Lee DS, Ahn KS, et al. Cytotoxic Activity of ß-Caryophyllene Oxide Isolated from Jeju Guava (Psidium cattleianum Sabine) Leaf. Rec Nat Prod. 2011;5(3):242-246. Palazzo MC, Agius BR, Wright BS, Haber WA, Moriarity DM, Setzer WN. Chemical Compositions and cytotoxic activities of leaf essential oils of four lauraceae tree species from monteverde, Costa Rica. Rec Nat Prod. 2009;3(1):32-37. Legault J, Dahl W, Debiton E, Pichette A, Madelmont JC. Antitumor activity of balsam ﬁr oil: production of reactive oxygen species induced by á-humulene as possible mechanism of action. Planta Med. 2003;69(5):402-407. Jafarian A, Ghannadi A, Mohebi B . Cytotoxic effects of chloroform and hydroalcoholic extracts of aerial parts of Cuscuta chinensis and Cuscuta epithymum on HeLa, HT29 and MDA-MB-468 tumor cells. Res Pharm Sci. 2014;9(2) : 115-122 .